Here is the 2016 Ottawa Senators Qualifying Tournament in its entirety. The top-seeded ’06-’07 Ottawa Senators got an early jump on the 2nd-seeded ’05-’06 Ottawa Senators in this series with a DOMINANT 5-1 win. However, this time last year, int he 2015 qualifier final, the ’06-’07 Senators held 1-0, 2-1 and 3-2 series leads over the ’05-’06 Senators, but fell. They would take a 2-1 series lead here, but dropped the next three games. The Pizza Line of Dany Heatley–Jason Spezza–Daniel Alfredsson played a big role for both teams in this series, and in Game 1 they combined for nine points for the ’06-’07 Senators. The ’05-’06 Senators responded from the poor performance with a 4-2 win in Game 2. Spezza scored twice in the win while Alfie totaled three points. Goaltender Dominik Hasek stopped 31 of 33 shots against in the win. The ’05-’06 Senators then trailed by one in the final five minutes of Game 3, but a goal from defenseman Brian Pothier forced an overtime. That didn’t last long, though, as Heatley scored the game-winner just nine seconds into OT for the ’06-’07 Senators as they took a 2-1 series lead. Game 4 was tied at three after two periods, but a goal each from Heatley and Antoine Vermette within the first six minutes of the third period would be all the ’05-’06 Senators would need as they held on for a 5-4 win to tie the series. In Game 5, the ’05-’06 Senators led 2-1 into the third period, but a PP marker halfway through the third tied the game for the ’06-’07 Senators. The game went to OT, and again, it didn’t last long. Tough guy Chris Neil won it for the ’05-’06 Senators just two and a half minutes into OT. Then, in Game 6, the ’05-’06 Senators needed overtime, again. 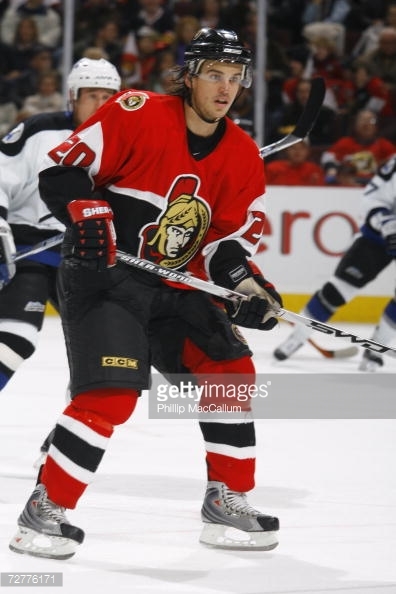 They also needed a game-tying goal in the third period to force that OT, but Vermette won it and the series a little over a minute into OT to clinch the UNP trip for the ’05-’06 Senators. Up next is the 2016 San Jose Sharks Qualifying Tournament! This entry was posted in Qualifying Tournament, Ultimate NHL Playoff and tagged Antoine Vermette, Brian Pothier, Chris Neil, Chris Phillips, Daniel Alfredsson, Dany Heatley, Dominik Hasek, Jason Spezza, Ottawa Senators, Peter Schaefer, Qualifying Tournament, Ray Emery, Ultimate NHL Playoff. Bookmark the permalink.